Hospitable Italy is so rich in various attractions that it’s simply impossible to count them all in one piece. Apart from being home to an impressive number of historical and cultural masterpieces, including magnificent museums, gorgeous palaces, and medieval castles, the region is also proud of its fascinating natural gems as lakes, volcanoes, caves, and mountains. As the list of best places to go in Italy is endlessly long, we’ve selected the most famous landmarks every traveler desires to discover. It would be strange not to start the list from the capital of Italy, ancient Rome. One of the most grandiose structures in the world which has survived till our days is the Colosseum which once served as a huge amphitheatre for gladiator matches, now this legendary monument is a true calling card of Rome as well as entire Italy. 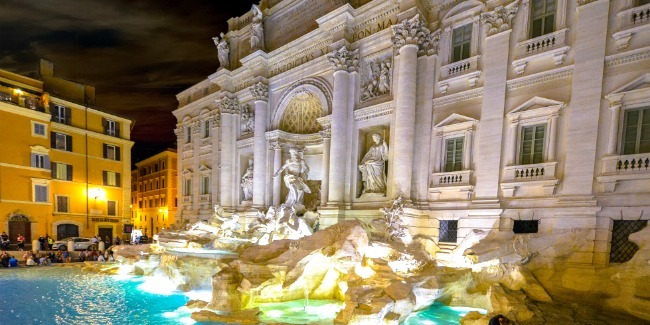 One more iconic sight of Rome and must see in Italy is the legendary Trevi Fountain. The Baroque style marble fountain is not only an amazing photo spot but a prosperous breadwinner as well. According to the local belief, a tourist who tosses a coin to the Trevi Fountain will return to Rome one day again. Can you imagine that annually this Roman destination ‘earns’ about 1,5 million euros? Would you like to follow the tradition as well? Any Roman holiday won’t do without visiting the place of pilgrimage for all Catholics of the world, the Vatican. The inner sanctum of this tiny independent state inside the city of Rome is St. Peter’s Basilica and the Piazza San Pietro. This one-of-a-kind cathedral is soaked in history as the fate of states and nations were decided inside these walls. Exploring the Vatican, it would be a mistake to overlook its Museums holding a great collection of art as well as the world-famous Sistine Chapel with the extravagant painting on the ceiling of the authorship of Michelangelo himself. You may be surprised to find out that the largest Italian cathedral is located not in Rome, but actually in Milan! One of the most impressive Gothic cathedrals in the country, Duomo di Milano, features fantastic marble decorations and is a must-see sight of the historic part of Milan. Even if you are not that religious, you will still be able to appreciate the masterpiece of Leonardo da Vinci, the Last Supper. The mural is displayed at the church of Santa Maria delle Grazie and is something you can’t miss. Can’t wait to see the works of art of the brightest Italians? Then you should head to Florence which is home to one of the most known galleries on the planet, the Uffizi Gallery. The impressive collection of paintings and sculptures will definitely satisfy your hunger for art. Another Florence destination that should be added to the top places to visit in Italy is the Cathedral of Santa Maria del Fiore, that towers the city and offers stunning views across Florence. The top destinations of the Italian south include the colorful Amalfi Coast with the most scenic Italy vacation spots including Palermo, Sorrento and Ravello; the motherland of pizza, Naples with the famous Royal Palace and the fortress Castel dell’Ovo; and the legendary ancient Roman town of Pompeii destructed by the eruption of Vesuvius. The isle of Sicily has gained popularity among travelers not only due to its gorgeous beaches but to unique locations found nowhere else in the world. These Sicily attractions are the archeological complex of the Valley of the Temples near Agrigento, the ancient theater of Taormina, the lovely city of Catania at the foot of Mount Etna, and the hometown of Archimede, Syracuse. Still not enough? You can also enrich your Italian bucket list with such Italian landmarks as the so-called Italian Riviera, charming Cinque Terre, the Leaning Tower of Pisa, the home of Montague and Capulet families, Verona, and the city of canals and carnivals, splendid Venice.